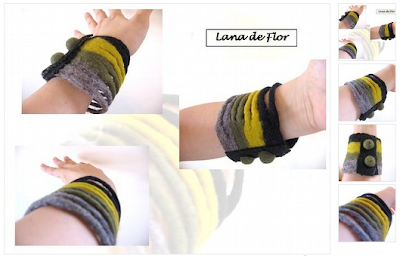 The Funky Felter: Funky's Fiber Artist Spotlight on Lana de Flor! A fellow feltmaker and Etsy seller! Funky's Fiber Artist Spotlight on Lana de Flor! A fellow feltmaker and Etsy seller! The Etsy shop Lana de Flor belongs to a lovely lady from Wooster, Ohio. She's a talented and innovative feltmaker who I've been blessed to have met through Etsy. Her shop name roughly translated means "flower wool" or "wool of flower" - this is very fitting as I have long admired her brightly colored, realistic flower pins, a staple of her diverse online shop. Recently she has branched out to include a some wonderful scarf and wrist cuff designs. You can see one of her corded cuffs in the main photo. It is a favorite of mine! I highly recommend that you go browse her entire Etsy shop, lanadeflor.etsy.com, for inspiration. Oh, and don't forget to buy one of her very unique felted accessories too. What a great way to accent your Spring wardrobe! *The image is a screen shot from lanadeflor.etsy.com. **If you'd like to submit a fiber artist (or yourself) for a funky felter spotlight article, you can email me via my website or scroll to the bottom of the page and use my contact form. And, be on the lookout for upcoming spotlight articles!